The End of Overeating: Taking Control of the Insatiable American Appetite is written by David Kessler, former head of the FDA. In this book Kessler explores the fundamental reasons why so many people struggle with food cravings and overeating. Kessler was intrigued by the fact that some people appear to have strong will power in many regards but still find it difficult to resist unhealthy foods. He interviewed a number of people including food scientists, food industry executives and everyday people with overeating problems to try to discover why some of us are so powerless when it comes to certain foods. Kessler explains how biological and psychological factors can trigger excessive food cravings that cause us to engage in “conditioned hypereating”. This basically means continuing to eat beyond the point where hunger and nutritional needs have been met. He discovered that when we consume a combination of sugar, salt and fat in certain combinations, this initiates a feedback loop involving the reward system of our brain. Once it has been set in place this feedback loop drives us to seek out and eat more and more food, even when we aren’t feeling hungry thus a food addiction is created. Those involved in the food industry are aware of this effect and actually attempt to achieve this so that we buy more of their products. They manipulate their food to be what The End of Overeating calls “hyperpalatable” so that we want to eat them frequently and in excessive amounts becoming addicted to them. Most of the book is devoted to the science of junk food cravings and overeating and uncovering the methods used by food companies to encourage consumers to overeat their food. Ultimately most of the responsibility for breaking free of overeating is placed on individuals although some general advice is provided. In terms of diet The End of Overeating recommends emphasizing foods high in fiber and protein because these help you to feel full for longer. It also encourages dieters to select foods that they enjoy because this will make it easier to maintain a healthy eating plan. Additionally dieters are advised to understand what triggers overeating and food addiction for them personally and to plan accordingly. He outlines practical tactics such as limiting exposure to trigger foods, learning to control thoughts about food and creating negative associations with unhealthy foods. Lean protein, whole grains, legumes, fruit, nonstarchy vegetables. The End of Overeating primarily focuses on the reasons why people overeat and does not include exercise recommendations. 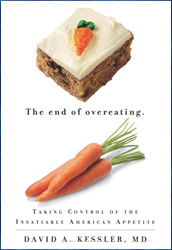 The End of Overeating: Taking Control of the Insatiable American Appetite retails at $15.99. Identifies the reasons why people experience excessive food cravings, addiction and overeating. Increases awareness of the methods used by the food industry to stimulate overeating in consumers. Provides evidence as to why controlling overeating is not simply a matter of willpower. Gives an explanation as to the current obesity epidemic. Encourages consumption of fresh unprocessed foods. Is not a structured weight loss program. Does not include a meal plan, other than one day of generalized recommendations. May not provide adequate guidelines or practical information for many dieters to overcome excessive eating and food addiction. Does not explain why some people overeat while others don’t. The End of Overeating provides a fascinating behind-the-scenes look at how modern food industry processing methods have manipulated much of the general population to experience constant food cravings and overeating. It also provides a scientific understanding of the biological and psychological basis of junk food cravings and excessive food intake as well as food addictions. This book will increase your awareness about the negative effects of processed and restaurant foods, while providing some strategies to help you break out of the cycle of overeating.